There are a range of different sizes available in different brands, so you’ll need to work out how much space you will need in it. For example, a taxi cab would just have a small amount of cash to be deposited and it would be emptied daily. A small safe would be appropriate. We would recommend the Burtons Mini Cash Guard. The safe has two locks, one for the base plate and another for the safe door. 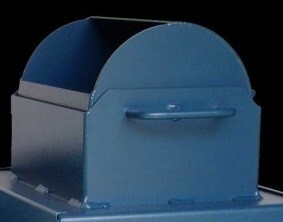 This allows for the body to be removed from the base plate without having access to the contents of the safe. For larger vehicles, like lorries and vans on delivery rounds, there are bigger safes available with different types of deposit slots. There are also different security levels available depending on the requirements. All these safes have base plates to attach to the vehicle and the main safe body is locked in to these. Slot Top Safes – As in the Burtons vehicle safe shown above, the deposit system is a slot which is handy for small items or deposits of cash. V Top Safes – The largest of the Burton vehicle safes has a V top which enables slightly larger items to be deposited. 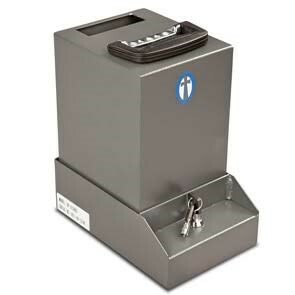 Roll Top Safes – These are very popular due to the extreme ease of use. The driver simply needs to place loose or bagged items or cash into the roller top, turn the roller handle and the contents drop into the safe compartment below. Many of these safes can be fitted easily yourself, however here at Thornhill Security in Bristol we are more than happy to install vehicle safes for you. If you have any questions or need advice on the vehicle safe that is right for you then give us a call on 0117 967 4994 and one of our experienced team will be happy to advise you.